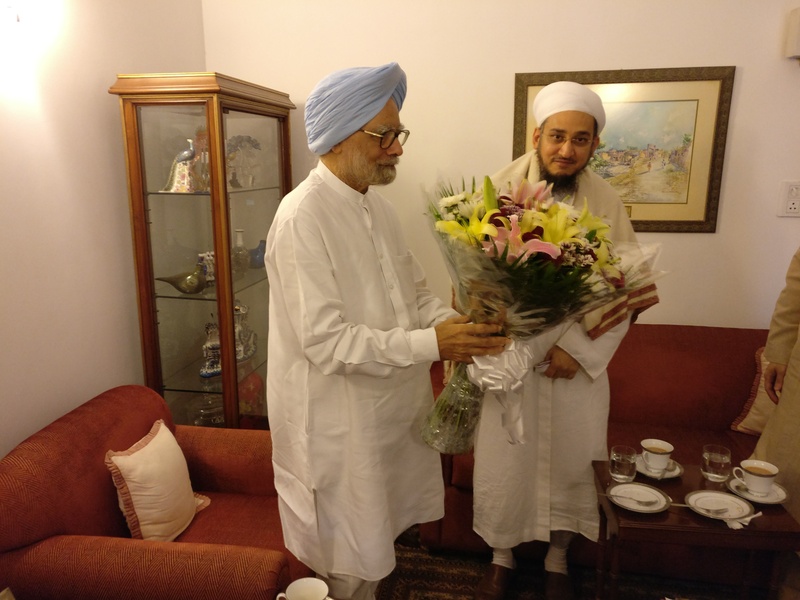 The former Prime Minister of India the Honorable Dr. Manmohan Singh gave a warm reception to Syedna Taher Fakhruddin TUS, head of the worldwide Dawoodi Bohra Community, at his official residence in New Delhi on Friday the 8th of July. The open and deep discussion on varied subjects lasted for more than an hour. Syedna Fakhruddin presented Dr. Singh with a bouquet of flowers and greatly appreciated his long service to the nation on behalf of Syedna’s community, and especially his pivotal role in bringing about and successfully implementing its economic reforms, and later 8 years as the Prime Minister. Dr. Singh fondly recalled his visit to the opening of Saifee Hospital and his meeting there with Syedna Mohammed Burhanuddin RA, saying that he was a truly magnanimous leader of great wisdom and compassion. Syedna Fakhruddin affirmed his and his community’s commitment to the progress of the nation and especially to upholding the worthy principles of pluralism and communal harmony. Syedna quoted Imam Ahmad al-Mastur who said that all creatures are God’s children, and the most beloved of them to God is one who benefits His children the most. 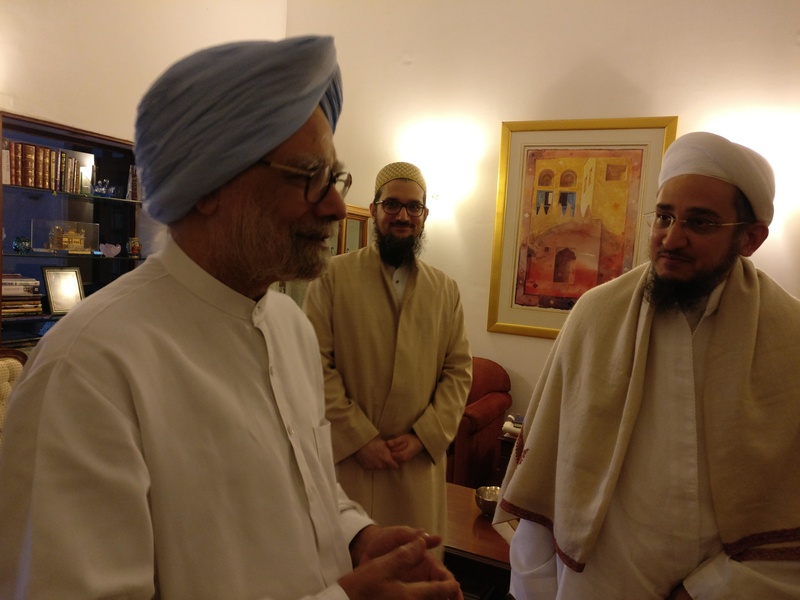 Dr. Manmohan Singh heartily agreed and appreciated Syedna’s sentiments and said that self-interest must not come in the way of communal harmony and inter-community cooperation. Syedna observed that it is very common for people to criticize others, whereas self-criticizm is very rare. Self-criticism is a great principle of our faith, and if only people were more self-critical than that of the other, then many problems would be solved, a thought which Dr. Singh greatly appreciated. Syedna Fakhruddin expressed his belief in the virtues of hard work and good character as a basis for the success of his community, and the nation as a whole, and recounted that one of our Imams refused to pray for a man who asked the Imam to ask God for him that he may receive his sustenance from God while resting at home. The Imam rebuked him and said that I will only pray for God to give you abundant sustenance if the heat of the sun lines your brow with sweat from hard work. Dr. Singh also appreciated the great weight of the responsibility that has come on Syedna’s shoulders. He remarked on Syedna’s unique background of being steeped in the faith tradition as well as having founded successful businesses in fund management and farming in California, USA. Dr. Singh recounted his days growing up on a farm in Punjab, and that today many initiatives to advance farming were being undertaken in India adopting techniques and technologies such as those used in USA and other parts of the world. Dr. Singh deeply appreciated the emphasis on education which Syedna Fakhruddin placed in his guidance to the community and especially the highly educated family of Syedna Fakhruddin himself. Dr. Singh also appreciated the contributions of Islam and Islamic scholars to the history and development of our knowledge and civilization. Syedna added that many today viewed Islam from a very narrow prism, which leads to many misunderstandings. He narrated how he had once explained to a friend who had been led into such misunderstandings that it was the Islam which first gave women rights in Arabia and instituted zakat and the social welfare system, which we follow to this day. Dr. Singh said, “the community is greatly blessed to have Your Holiness as a leader.” And that the country would be a better place if people followed Syedna’s guidance in the values and ethics of life. At the conclusion of the meeting Dr. Singh asked Syedna to “pray for the country,” and then accompanied him all the way to the car.